The United Nations cultural agency has adopted a controversial resolution which makes no reference to Jewish ties to a key holy site in Jerusalem. Unesco's executive board approved the Arab-sponsored resolution, which repeatedly refers to only the Islamic name for a hilltop complex which is also the holiest site in Judaism. The site is known to Jews as the Temple Mount and Haram al-Sharif to Muslims. The resolution caused Israel to freeze co-operation with Unesco last week. The stated aim of the text was "the safeguarding of the cultural heritage of Palestine and the distinctive character of East Jerusalem". 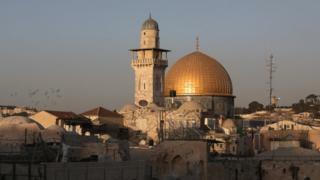 It criticises Israel's activities at holy places in Jerusalem and the occupied West Bank. But it is how it refers to the sites which prompted Israel to act against the cultural body. While acknowledging the "importance of the Old City of Jerusalem and its walls for the three monotheistic religions", the document refers to the sacred hilltop only by the name "al-Aqsa Mosque/al-Haram al-Sharif" (Noble Sanctuary). It is the location of two Biblical Jewish temples and is flanked by the Western Wall, venerated by Jews as part of the original supporting wall of the temple compound. Haram al-Sharif is also the place where Muslims believe the Prophet Muhammad ascended to Heaven, and is the third holiest site in Islam. The draft refers to the precinct in front of the wall as "al-Buraq Plaza 'Western Wall Plaza'" - placing single quote marks only around "Western Wall", giving the name as it is known to Jews less weight than the one by which it is known to Muslims. Unesco's executive board chairman Michael Worbs said on Friday he would have liked more time to work out a compromise. He told Israeli television network Channel 10: "It's very exceptional what happened yesterday, and I'm sorry for that." On Tuesday, Israel's Unesco ambassador, Carmel Shama Hacohen, accused the Palestinians of playing "games". "This is the wrong place to solve problems between countries or people," he told AFP. But Palestine's deputy ambassador to Unesco, Mounir Anastas, welcomed the adoption of the resolution, saying he hoped it would put pressure on the Israeli authorities to "stop all their violations", particularly the excavation of sites in and around the Old City. Image caption Israel's Unesco ambassador Carmel Shama Hacohen accused Palestinians of playing "games"
The resolution repeatedly denounced Israeli actions, including the use of force, imposition of restrictions on Muslim worshippers and archaeological work. Israel regards such criticism as politically motivated. It led Israeli Education Minister Naftali Bennett to say Unesco was ignoring "thousands of years of Jewish ties to Jerusalem" and aiding "Islamist terror". Unesco chief Irina Bokova also criticised the draft resolution, saying "different peoples worship the same places, sometimes under different names. The recognition, use of and respect for these names is paramount". However, Mr Bennett said Ms Bokova's statement was insufficient. "Words are important, but they are not a replacement to the actions of the organisation she heads," he said. Israeli Prime Minister Benjamin Netanyahu said in a Facebook post that Unesco had become a "theatre of the absurd" in taking "another delusional decision". "To say that Israel has no connection to the Temple Mount and the Western Wall is like saying that China has no connection to the Great Wall of China or that Egypt has no connection to the pyramids. By this absurd decision, Unesco has lost what little legitimacy it had left."